The creation of the hat crown is the first step in making the hat. 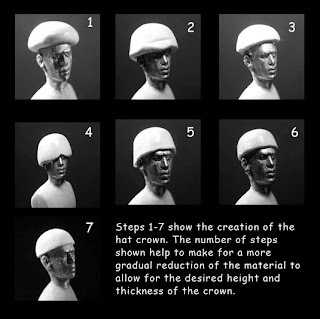 I learned this method of hat making from Mike Blank's book about sculpting figures. The first step is to lightly coat the top half of the head with Vaseline to facilitate easy removal when complete. For step 1 a small blob of putty is pushed down onto the top of the head. The objective is to work the putty down to the proper height and thickness required. In step 2 the material is worked down and marked to where I want the edge of the crown to be. In step 3 you see the amount material that has been removed. This process is repeated until you get the crown to where you want it. In step 7 I then go in with sandpaper or fingernail sanding boards and clean up the shape and thickness of the crown around the bottom edge.